April showers bring the first medicinal bloom of spring – coltsfoot – Tussilago farfara (say Latin plant names out loud five times- it’s good for your brain). This common weed is found in abundance in disturbed sites, preferring gravel and cement to soil (look for it at the base of building foundations). It is often mistaken for dandelions, but upon close examination their differences are clear. Unlike most flowering plants, coltsfoot produces flowers before leaves. The flowers are shaped like a wheel and are bright yellow. The stems are scaly. The leaves are almost round, paler underneath and covered in a soft downy mesh. The flowers are harvested in early spring and the leaves in late spring. The Latin name comes from tussis (a cough) and ago (to banish) – it is an excellent respiratory remedy. It is soothing to dry airways due to its mucilage content. 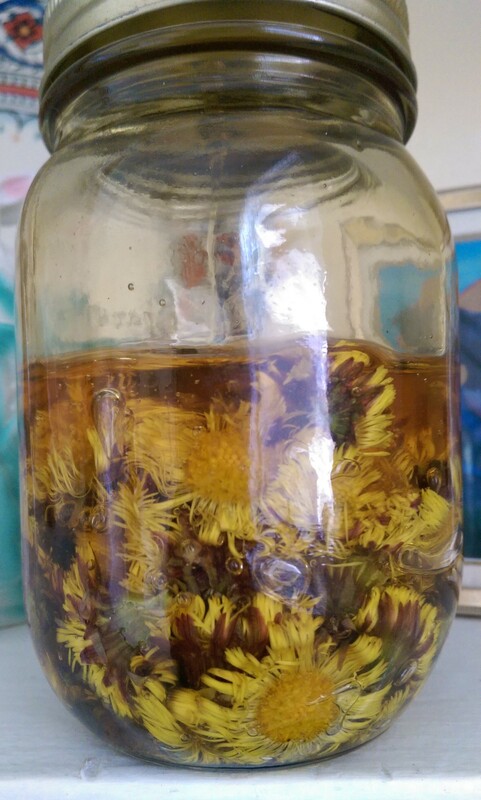 It was traditionally used in smoking mixtures to treat asthma and as a spring tonic for clearing lingering respiratory fluids from winter colds. As a compress it is a wound healer and anti-inflammatory. There has been controversy over coltsfoot’s safety and that of other pyrrolizidine alkaloid (PA) containing plants such as comfrey and borage. Animal experiments have shown PA to be a liver toxin. As is often the case, findings are contradictory. Coltsfoot has been used medicinally for centuries and herbalists continue to use this powerful herb with awareness, in therapeutic doses, for short periods of time. Prepared as either a hot or cold infusion, it makes a thick, mucilaginous brew. Coltsfoot flower honey is my favourite use of this herb. Wilt a cup of the flowers for three days, then put them in a glass jar and cover them with honey. Let it sit for one week, then strain the honey. The honey will extract its wild fragrancy and some of its medicinal properties, add it to your herbal teas. May the return of the green bring freshness to your senses and vitality to your spirit. Thanks Savayda! I’ll be watching for coltsfood in my walks. Great to see you are starting a blog to share your wealth of knowledge. Looking forward to your new blog! I always wondered if coltsfoot was a plant that could be used medicinally, I will give it a try. Hi, Savayda, Love your New Website, Looks Great, So do You, Love and Herbal Blessings, Janette. The leaf actually looks like, a young horse’s foot, a colt’s foot!